1. Self- owned factory, prompt delivery. 2. Quality craftsmanship and perfect materials. 3. Provide you our best price according to your quantities. 1. 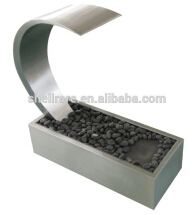 This Floor standing water fountain is made of Stainless Steel which provide a very rare opportunity of adding the beautiful natural flowing water sound to your leisure or business. It would be as impressive offices, reception rooms, restaurants and gardens . 2. When the water streams down their panel, the panel is a stunning, contemporary free- standing fountain that will create peace & serenity and beneficial ions for the mind, body and soul . 3. the garden, the basin can be buried into the ground to create the effect that the waterfall is growing along side of the flowers. 4. The fountain includes a pump, lights and polished river stones. 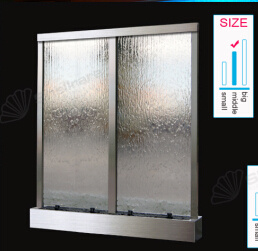 The waterfall is rated for all weather conditions and can be used indoors or out. Water streams down the front one side of the panel only .